@leahy.colhoun: What are the primary factors contributing to distressed communities based on your work with the DCI? 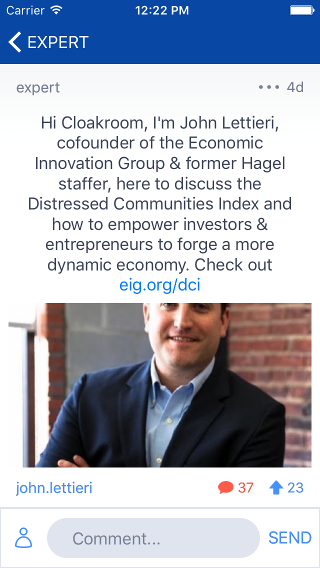 The DCI is based on a mix of 7 economic indicators, which include poverty rate as well as gain/loss in businesses and the housing vacancy rate (to see the full list for to eig.org/dci). We designed it this way to capture a multidimensional view of US communities. This allows us to see not just where the distress exists, but what the key factors are in any given community. @leahy.colhoun: Thanks, @john.lettieri -- which towns/cities have fallen into the recovery gap the worst? Any surprises? Many Rust Belt cities are facing severe challenges -- not a huge surprise given their struggle to transition from legacy industries, like manufacturing, to those that are more knowledge-based. But one of the key insights of the DCI is the finding of persistent pockets of economic distress alongside tremendous prosperity and economic growth. This suggests that our current growth strategies are not actually reaching many of the communities that need it most. So we have to ask, what are we trying to achieve and who are we trying to achieve it for? @locke.bell: Has the recovery simply left some communities behind, or has it actually made things worse for some places? Who's gotten it the worst? The recovery has actually left places much worse off than before. We call this the recovery gap. It makes sense that you'd see different rates of recovery, but we uncovered the startling fact that distressed communities never ended their recession, even years after the national recovery. @dudley.morris: Do you believe that the investors are the best hope for helping distressed communities recover? Or is an investment driven approach simply lower hanging fruit than comprehensive economic reforms? Investors are an essential ingredient. Government and philanthropy alone aren't sufficient drivers of economic activity -- or best positioned to deploy capital in new ventures. Right now our models for incentivizing private capital are stale. That's why we're excited about the new Scott-Booker-Tiberi-King legislation, the Investing in Opportunity Act. This is a truly innovative approach to getting investors to aggregate their resources & deploy them in a targeted way. @leg.branch.cap: Is your whole investment approach to recovery about making capital available to startups who want to startup in poor communities? Or is there something I'm missing? That's one key part. We've focused on access to capital more broadly than just the startup community. This means getting investors more engaged in the full range of needs which would include infrastructure, blight removal, real estate dev, etc. But this is not just a challenge for distressed communities. Many middle income communities are also facing significant challenges with access to capital. @carlile.mellen: If I'm an investor, why do I care about this bill? What kind of investors is this targeting? Great question. The legislation targets investors who are sitting on significant amounts of unrealized capital gains. Right now we estimate that there are 2.3 trillion dollars worth of unrealized cap gains in stocks & mutual funds alone, a significant untapped resource for econ dev. IIOA allows investors to reinvest that capital seamlessly into funds that target distressed communities. And it incentivizes long-term investors commitment in areas that need it most. @morrow.fish: How does a fund get credentials as a distressed community fund? Does this end up being a government handout to a couple large mutual fund companies? The Opportunity Funds must invest substantially in qualified communities. Investors aren't getting taxpayer financing in the for of guaranteed loans or tax credits; they're using their own capital, but with tax incentives tied to long-termism. This keeps cost to taxpayer low. @tribal.crane: So basically the Bernie message: the rich in cities are doing better than ever and the poor in the same cities are doing worse than ever? The DCI analyzes something we call "spatial inequality" -- the extent to which prosperity or distress is shared within a city or county. It's not as simple as "rich city vs poor city" or "rural vs. urban". People in adjacent zip codes are worlds apart in terms of community well-being. We think spatial inequality is in many ways more relevant than income inequality alone as a metric. @conspickle: How can we be sure this IIOA thing isn't just a tax loophole for Sean Parker? I guess you'll do have to read the bill!  The IIOA goes to great lengths to link incentive with real economic activity. For investors to benefit, they have to keep their capital in play in economy-enhancing ventures in distressed areas. It includes rigorous safeguards to prevent abuse.